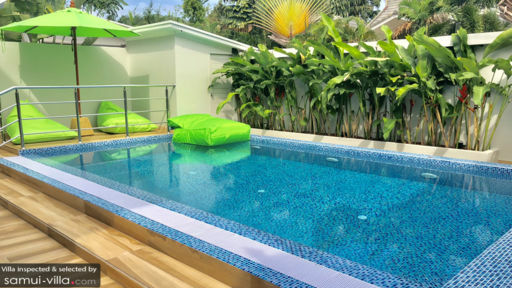 Villa Bellini is just as fun and bubbly as it is wont to be with vibrant colours masking the indoors and outdoors, a refreshing private swimming pool inviting you in, and luscious tropical flora to add a heady aroma outdoors. 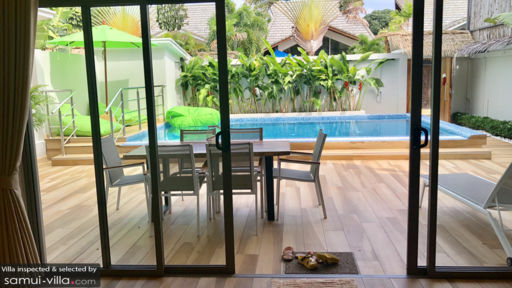 The beautiful villa is part of Ban Tai Estate near Bang Po beach that offers luxury holiday homes in Samui. With effervescent living and contemporary interiors, the three-bedroom home provides a safe haven to guests wherein kids and adults both can find something they love. From utmost relaxation to the most serene ambiance, Villa Bellini has it all. Villa Bellini is home to three, modern bedrooms of which two are found upstairs and one downstairs. The bedrooms have been decorated with minimal fanfare to keep them simple and homely. They are air-conditioned and features large glass doors leading to delicious, luscious flora. One of the upstairs bedrooms even adjoins to a terrace overlooking the pool area. The king-sized beds are uber comfortable and you can even ask for a baby cot, if required. TVs are fitted with each bedroom to serve the purpose when you wish to laze around and watch a movie. Ensuite bathrooms are well-fitted with useful and convenient amenities such as walk-in showers, etc. Landscaped with the best, Villa Bellini offers a private haven where you have a gorgeous turquoise swimming pool amid luscious flora that lines the periphery of the villa. Providing you with ample security and safety to ensure that you can rest easy without worrying about a thing, the villa management takes care to make your experience worthwhile. A raised platform beside the pool doubles as a lounge with comfy and snug neon green bean-bag loungers. 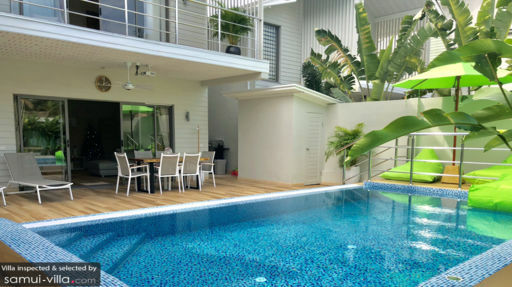 The wooden pool deck houses sun chairs for soaking up some tropical sunshine. The best part however, has to be the outdoor cinema with a massive, roll-down projector screen for the most romantic movie experience. The modern living space is located poolside with only glass doors separating the two areas. It is air-conditioned so you can enjoy a cooler climate indoors while the outdoors gets too hot to handle. The space has been designed with elegant, modern touches such as the modular sofa, bright green throw cushions, and a small dresser with a mirror. For your entertainment, the living area is fitted with a flat-screen TV with Smart TV facilities so you can even view your favourite TV shows right here. There is a beautiful and convenient fully-equipped kitchen right beside the main sitting area of the living room. The kitchen has been decked out in the most refreshing shade of green and features a breakfast bar with a marble top and bar chairs for a nice, little spot for some breakfast and a drink. Modern appliances like a refrigerator, coffee machine, etc. are found in the kitchen as well. The dining area is located outside on the veranda with a six-seater dining table where breakfast will be a feast to remember. Since the villa is part of an estate, the staff is especially well-trained and you have to access to more than just the amenities offered by the villa. The staff served a most delicious breakfast each morning and you can make request such as any preferences for children, etc. If you wish to plan your day, the management is happy to help with recommendations and ready advice. Book a car or a scooter to take you around, appoint a personal chef, and even book a private massage right at the villa. These services are charged additionally. The location is idyllic and you have Bantai beach right at your doorstep. Head outdoors for languid walks along the coast or explore the area where you may find a restaurant like Haad Bang Po and Namu or a café to your liking. The place warrants a serene atmosphere for the best, tropical holiday of your life.